Of a dark complexion, with white locks hanging down to his ears, that old man of five and eighty years of age, used, for thy sake only, to career on the field of battle with the activity of a youth of sixteen. That means one translation says the age of Drona was 85 years while another says the age of Drona was 400 years. 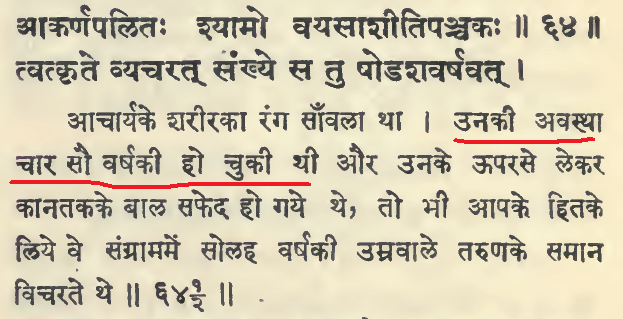 Can anyone please clarify how others (like BORI) translated this or provide meaning after breaking words and then using Sanskrit dictionary? Browse other questions tagged mahabharata translation-request dronacharya .